As both champion Naomi Osaka and runner-up Serena Williams stood with tears streaming down their faces at the end of the women’s U.S. Open final on Saturday, boos rang out from the crowd, where many felt that a chair umpire’s call had marred the match. The reactions came after chair umpire Carlos Ramos gave Williams a warning for allegedly receiving coaching and later a point penalty over her smashing a racket. Williams then accused Ramos of stealing the point from her, calling him a “thief,” resulting in a whole game penalty for verbal abuse. On Sunday, the three code violations resulted in the tournament referee’s office fining Williams a total of $17,000. The penalties — and whether they were justified — sparked debate over whether women in the sport face a double standard. After the game, which ended what would have been a record-tying 24th Grand Slam title for Williams, she told officials the calls were sexist. Osaka finished with a 6-2, 6-4 victory, making her the first player from Japan to win a Grand Slam singles title. The win also came with jeers, though Williams asked the crowd to stop booing and support Osaka. Dunja Antunovic, an assistant professor of sports communication who has studied gender in sports, said that this latest incident continues to build on an ongoing dialogue. "What’s new recently in the last couple of years is that there has been a lot of conversation about these instances and the critique of how some of these situations are gendered," Antunovic said. That view was expressed by many on social media on Saturday night and Sunday morning. Former and current tennis players weighed in on the chair umpire’s decision, with some agreeing with Williams’ assessment and claiming they’ve said worse and not been penalized as harshly. Roddick, a former world No. 1 professional tennis player, also said that he's "regrettably said worse and I've never gotten a game penalty." Williams' coach, meanwhile, said that the umpire had made himself "the star of the show" at the final, usurping the athletes so many had come to watch. Billie Jean King, a former World No. 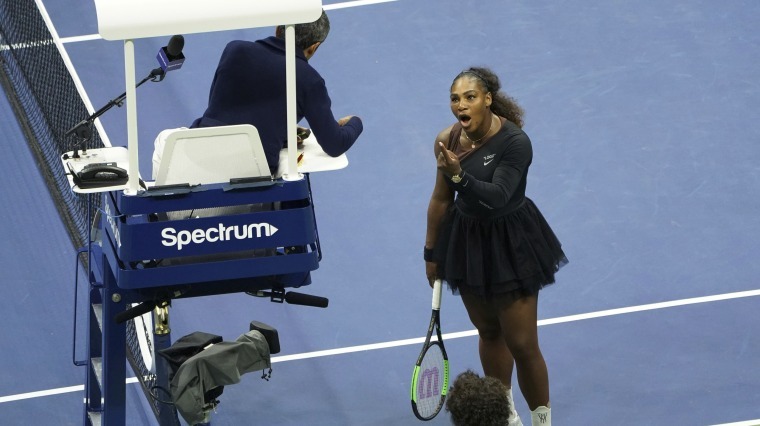 1 professional tennis player and namesake of the stadium hosting the U.S. Open, came to Williams' defense as well, stating there is a double standard in how women are depicted and considered in sports — especially when they are outspoken. Antunovic said that this gendered dichotomy can be seen in the modern American workplace. "Women are described as emotional and not as tough or prepared to deal with tough matches," she said. "There has been some evidence that the commentary and the way we interpret women’s behavior in sports tends to be different than men. That’s also how women’s behavior is interpreted in the workplace. What’s seen as disruptive for a women is seen as leadership for a man."